First time poster, but I've been making CG successfully with the maltodextrin method, #3 I believe it is. I feel fairly confident in the procedure now; I have my own understanding for the temperatures and the amounts. However some things I haven't had the time to test or test repeatedly, as making a batch itself is pretty time-consuming. And waiting months to see how well the batches hold up is, well.. the batches don't last that long. Basically my cook consists of a tiny pinch of sodium carbonate, appropriate amounts of salt and maltodextrin. I heat it up to at least 162F and then apply the current, 24V 1A. Electrode distance does not seem to matter too much. Keeping temperature slightly above starting temp is enough to produce good colour without too much evaporation. When the time's up, I remove the electrodes and cook the CG to about 200F for ten minutes or so. This seems to deal with the chlorine. - It seems that I can up the amount of salt & maltodextrin to approach 50 PPM successfully. I get a deep red, almost purple. Is the problem with 50 PPM that there will be more sediment, and sooner? Otherwise it's working surprisingly well. - I have a table salt here that includes E535, sodium ferrocyanide. Sounds scary. How dangerous is this if used to produce CG? I realize I should simply not use it (and will not use it in the future), but I made a couple of batches with it already so I'm curious. - I remember reading that using the electrolysis, salt & maltodextrin method, when the reagents are well-measured and they run out, I can 'overshoot' the cook and it won't produce additional gold ions. So to reach PPM more or less accurately, I can simply let it run a little longer. However I'm still seeing bubbles off the electrode no matter how long I run it. What's up with this? Thank you for this fantastic resource. I've been making silver with my own generator for years (Germany has an active generator building community), but never CG. Bubbles on the negative electrode are hydrogen, and will be continually made. Bubbles on the positive electrode are oxygen, chlorine until it runs out, and some carbon dioxide. Thanks, I figured something like that. I got a new power supply, which is able to do 34V. My previous supply ran at 24V. With the new one, I have been putting the electrodes further apart, which ends up giving me ~150-200mA. If I put them within a centimeter, I get a maximum of 300mA. I never measured mA on the old one but assume it was in the ballpark. Anyway.. this is still all using Electrolysis III. For 500ml that's 300mg salt and 1g malto for 50ish PPM. With 24V I got a deep, deep ruby red. With the 34V unit I get that too, but the end result is an oily (as in blackened) reddish purple that I can barely shine my flashlight through. Pouring some into a cup, I still get a red, though a bit more on the purplish side. 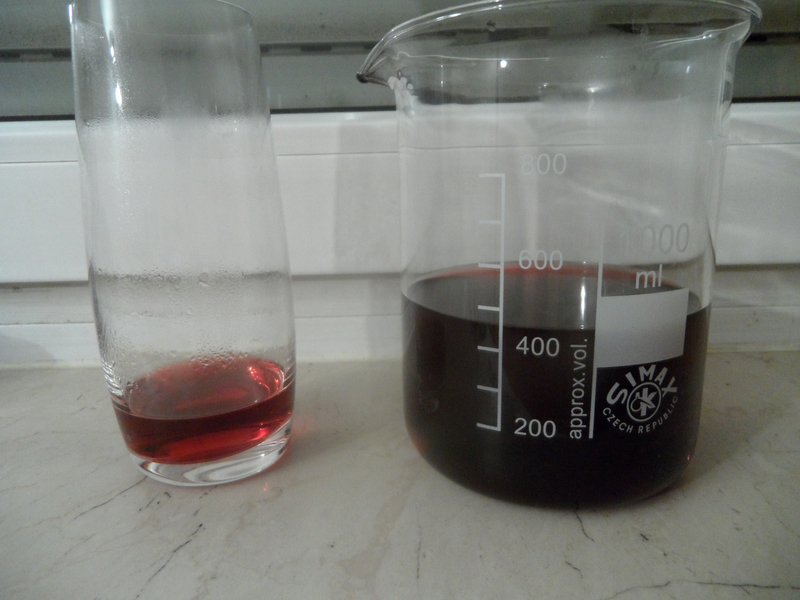 It looks fine in a smaller glass, but in the beaker the stuff is *dark*. I'm thinking I should put the electrodes closer together again. Nothing else changed. 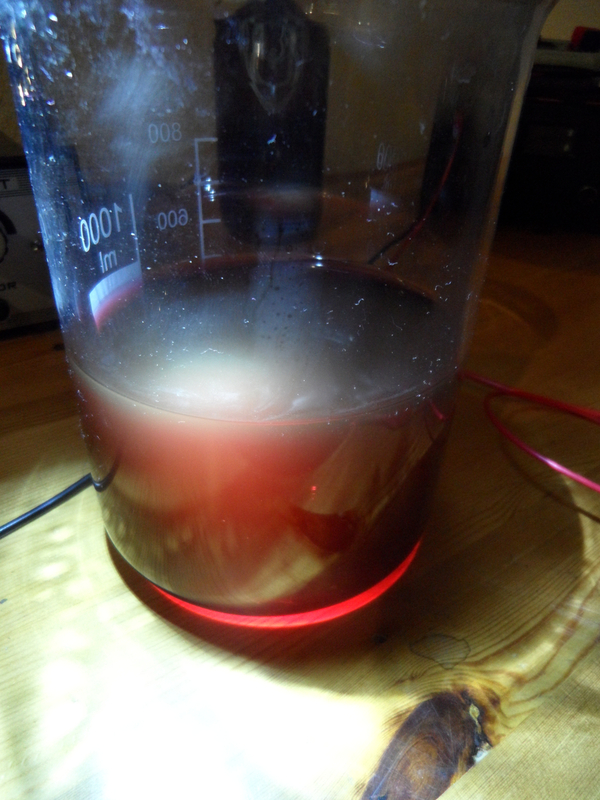 I regularly let the 24V CG overcook by quite a while to be sure it goes to saturation. It should have been enough to approach the 34V final result. Right now 34V is not as good for me and I can't figure out why. Equipment is clean, water is fine, measurements are 1:1. Only voltage/current and electrode spacing differ. It kinda looks like the 'good' 1600PPM sample (http://oi63.tinypic.com/24l52fk.jpg) someone posted a while ago. But surely it shouldn't be that different from my usual results, and certainly not that opaque at 50. Shining the flashlight *behind* it still gives me a nice, transparent, dark red. Maybe I'm getting more tyndall somehow? So, you have too much salt. For 500ml batch, salt should be 240mg. And that picture you referenced is not 1600 ppm. There is no way to measure it accurately, certainly not with a TDS meter, so I don't know where that number came from. I'm sure though that it is not accurate. But I also use more maltodextrin. I went from 240 salt / 800 malto to 300 salt / 1000 malto for slightly higher ppm, so they're proportional. If I understood it correctly, ppm is not linear but doesn't that still work out? P.s. : I'll have a couple of pictures once this batch is done and we'll see where we're at. So far it looks like tighter electrode spacing for slightly higher current (200mA) is giving me better color. Do as you wish, I'm just saying that is not my formula... so I don't know what will happen. The formula already has excess maltodextrin. Understood. I have been using that formula very successfully, which is why it's so frustrating that going from 24V to 34V would turn beautiful CG into this darker product with a noticeably muddy tyndall effect. Electrode spacing didn't do a thing. Could an unsteady voltage (it varies between 32.8-33.5) be messing with the particles? Tomorrow I'll do a batch with the old power supply for comparison. Your pictures show a high amount of very large particles. Varying voltage won't do that. Thats the only thing I can think of at present. Thank you for the help, as always. This is interesting. It may be possible that a lower voltage allows for slightly higher ppm to be cooked successfully, at the expense of runtime. I'll try both ways tomorrow. I think the lower voltage gives a lower ppm due to its lower efficiency. Ergo higher stability. The difference between making gold vs making silver lies in the fact that a gold atom has to pick up 3 chlorine ions to free it from the bulk metal by make a soluble gold chloride molecule. With silver it only requires one OH ion to free it. But once a gold ion has captured one chlorine ion, its electrostatic attraction is decreased, so it is less likely to catch the second chlorine, and even less likely to capture all 3 it needs. Higher voltage and higher current seems to increase the likelihood of any gold atom of capturing all three because of the increased electric field strength and number of chlorine ions bombarding the anode. Okay, so far it looks like whether I use Electrolysis III or my "50 ppm" formula makes little difference. Whether I use the 34V or 24V supply also makes little difference. On a positive note, this means my "50 ppm" values as well as my power supply are most likely fine (as they have been fine before) and I can look for the issue somewhere else. Probably the water. This brand of demineralized water has been working well until now, but maybe I got a bad batch. I went ahead and ordered a distiller. Will append photos of the whole lot once they're done cooking. Edit: Here are the shots. This is frustrating. Only one sample is lighter than the others, and with less visible grey refraction. Why aren't the other E.III samples good? (I did a few more, not shown) The only one with very little tyndall is the 24V one. I thought it could be the new salt, but I'm getting similar results with either now. I wonder if bad water would be consistent with what I'm getting. Water is very important, and de-ionized is not the same as distilled. However, all of your samples look usable. Remember that if you don't add anything toxic, and use sufficient reducing agent, the result will be non-toxic. The tyndall shows you have some large particles, and those particles will be ineffective, but the ruby red color shows most of your gold particles are correct. So, I would have no qualms about using them. Striving for a lower tyndall effect is still a good thing though. Let us know how the new water works out. I used to have a home distiller, but the quality of the water it produced was no where near as good as the distilled water I get from my grocery store. 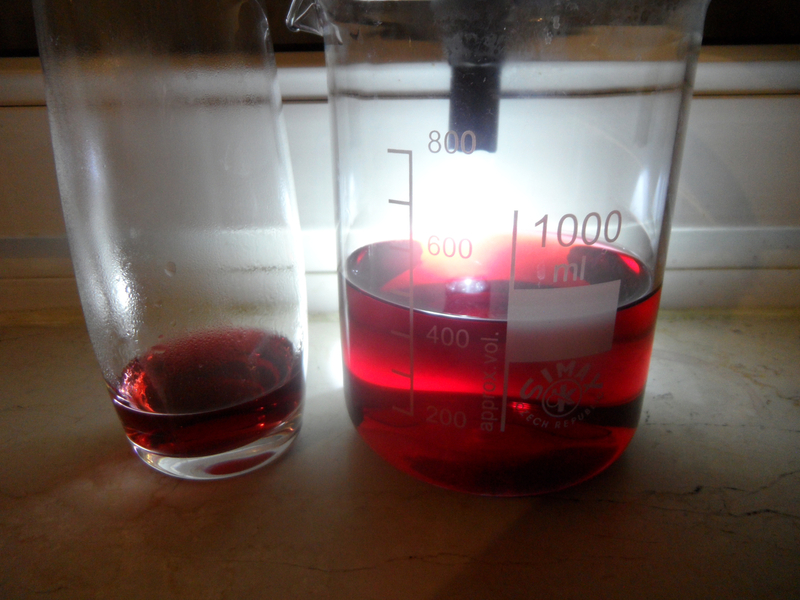 A 'Zero Water Filter' produced better quality water than my home distiller did, and produced very good colloids.